Comair pilots' failure to notice clues that they were heading to the wrong runway was the primary cause of last summer's deadly Kentucky plane crash that killed 49 people, safety investigators concluded Thursday. The National Transportation Safety Board deliberated all day on possible causes of the Aug. 27, 2006, crash of Comair Flight 5191, which tried to depart from the wrong runway — a general aviation strip too short for a proper takeoff. Board members originally had considered listing errors by the air traffic controller as a contributing cause but ultimately pinned most of the blame on the pilots and the Federal Aviation Administration's failure to enforce earlier recommendations on runway checks. NTSB board member Deborah Hersman suggested during the meeting that there were numerous causes — nearly all of them human. "That's the frustration of this accident — no single cause, no single solution and no 'aha' moment," Hersman said. "Rather than pointing to a mechanical or design flaw in the aircraft that could be fixed or a maintenance problem that could be corrected, this accident has led us into the briar patch of human behavior." Staff members also concluded the flight crew's lack of updated maps and notices alerting them to construction that had changed the taxiway route a week earlier was not a factor in the navigation error. NTSB staff member Joe Sedor identified one possible overriding factor — nonpertinent chatter between pilot Jeffrey Clay and first officer James Polehinke as they prepared to taxi and take off. Comair has acknowledged some culpability as a result of the talk, which violated FAA rules calling for a "sterile cockpit." Sedor said the talk "greatly affected the crew's performance." Hersman agreed but suggested the disaster couldn't be pinned on that alone. "It's clear this crew made a mistake," Hersman said. "Their heads just weren't in the game here. The issue is, what enabled them to make this mistake?" Hersman pointed to the paperwork the crew never got detailing the taxiway change. Not only was it not in their packet from Comair, but the air traffic controller didn't broadcast the announcement that morning, even though it had been doing so the rest of the week. 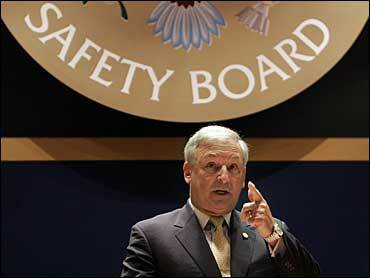 NTSB chairman Mark Rosenker said many things could have prevented the crash. "We deal in redundancies in this business," Rosenker said. "That's what enables us to look after each other in the cockpit, and if one of the crewmen fails to do something, the other is there to help fill in the gap." No witnesses were called at the board meeting. Investigators said a lone air traffic controller on duty used poor judgment by turning his back before takeoff, but they debated whether a required second controller could have prevented the accident. NTSB staff concluded controller Christopher Damron should never have turned away to do an administrative task "not critical to flight safety" as the jet was preparing to depart. However, the staff dismissed as a non-factor the violation of an FAA directive calling for two controllers to work overnight shifts in airports like Lexington — one to keep an eye on the ground, the other to monitor radar. About 25 relatives of crash victims gathered at a hotel in downtown Lexington on Thursday to watch a video link to the hearing. "You just think that if one precaution had been observed, then this tragedy wouldn't have happened, and we would still have our loved ones," said Lois Turner, whose husband was a passenger. "And that, I think, is the sad part and the hard part, to know that there were so many missed opportunities."